This is an easy one but we get it a lot. You may be a store who dropships and needs to inform the customer that their order may be dispatched in multiple packages. Another example may be you sell restricted items and need to add a disclaimer to the cart for individuals to read before checking out. If you are confident with HTML and Shopify’s Liquid Snippet, you can simply open up your Shopify’s theme files, navigate to the cart.liquid and paste in your message there with the appropriate markup. Be careful not to paste it where it will break your liquid template. Always take a backup and make sure you know what you are doing! If you aren’t confident, then you can simply use an app. Its a safe way of getting the desired result and often comes with added features and benefits. Check out Kartify on the Shopify App Store. 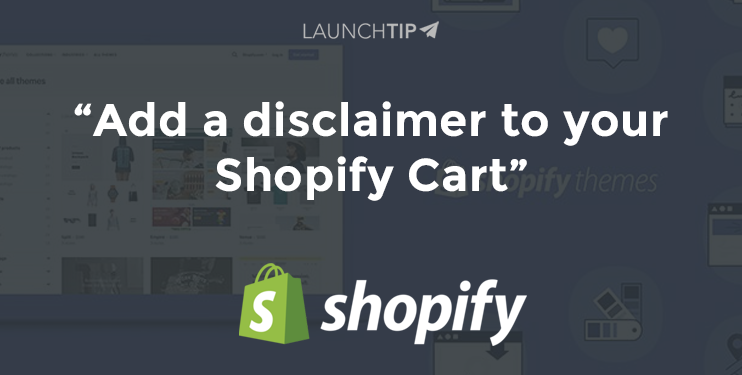 With Kartify, you will be able to add a disclaimer message to your shopify cart page. If you are a dropship store, then you can add a note that orders may be dispatched in multiple packages. Keep it clean and simple. Some great side features of Kartify is Upsells as well. Thats right, you can add some generic store wide upsell products right in the cart. This way, the App will end up paying for itself and make you additional revenue from the upsells. A true win win!